Contents: (upper) Mini frittata made with leftover pasta (recipe/tutorial below), hard-boiled egg shaped like a car, and grapes. (lower) Leftover grilled shrimp with wasabi bread crumbs, cherry tomatoes, grilled zucchini and butternut squash, and cheese triangle. Morning prep time: 15 minutes. The zucchini and squash were already cut and prepped from a picnic; I microwaved them in a covered bowl with a splash of water first to speed up grill time (no-cost substitute for a microwave mini steamer). A friend had made the shrimp, so that was leftover too. I'd made a batch of eggs before, so it was waiting in the fridge in the mold. The frittata was the most labor-intensive thing in the morning. Packing: Lettuce can also act as an edible food divider (instead of hard-to-find plastic food dividers). I cut the tails off the shrimp for neater eating. 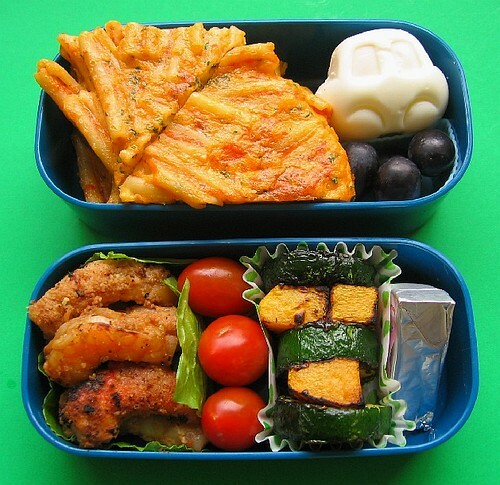 Japanese bento cookbooks often show the speed technique of cooking different kinds of food together in the same pan, pot, broiler pan, etc. This is a variation: multi-grilling on a stovetop grill. 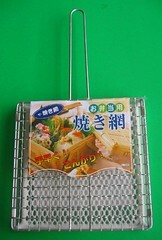 Similar to a Japanese fish grill, this one has finer mesh on the top so that vegetables don't fall through, and is marketed as being the right size for bento lunches. Just put it on your gas or electric stove, heat, oil the grate and grill food (veggies, meat, fish, etc.) as if you were outside -- much faster than firing up the outside grill in the morning (yeah, who's going to do that?). 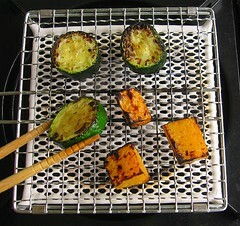 Mini stovetop grill bought for US$1.50 at Daiso (Japanese dollar store with stores internationally). Amazon carries a slightly larger Japanese stovetop grill here . Contents: Bug (my two-year-old) had a mini pasta frittata, grape, leftover grilled shrimp with wasabi bread crumbs, and little skewers of leftover grilled zucchini, butternut squash, green bell peppers and cherry tomatoes. Morning prep time: 15 minutes. The shrimp and the vegetables were leftover from a Mother's Day picnic, and the pasta in the frittata was also leftover. The only dish made especially for this lunch was the mini frittata. Packing: Lettuce can also act as an edible food divider (instead of hard-to-find plastic food dividers). 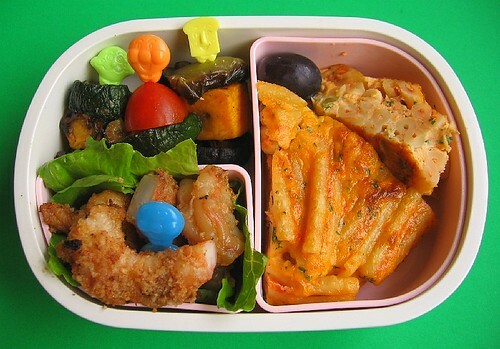 Little Anpanman-character picks make it easy for little hands to manage the grilled vegetables, and the blue pick is for the slightly messy shrimp. I cut the tails off the shrimp and halved them to make it easier for Bug to eat. The lone grape acts as a gap filler to keep the lunch from shifting during transport. In a bowl, beat together the eggs, cheeses, parsley and pepper. 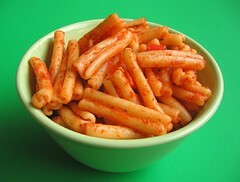 Add leftover pasta and stir well. Pre-heat broiler, and heat a mini frying pan (8-inch or similar) on medium heat and oil pan (with cooking spray, vegetable oil or butter). 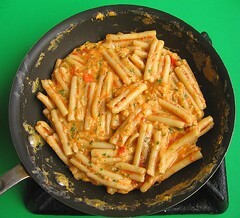 Pour in the egg and pasta mixture, and stir with a heatproof spatula until curds have formed in the egg. Use the spatula to pat the pasta down and shape the sides into a disc (will look like the fourth photo above). Run the pan under the hot broiler until the top is golden brown, remove from heat and let sit for a few minutes. Residual heat will continue to cook the inside of the frittata without turning it rubbery. If necessary, run the rubber spatula under the frittata to loosen it from the pan, and turn it out onto a cutting board. Cut and serve (additional sauce optional). 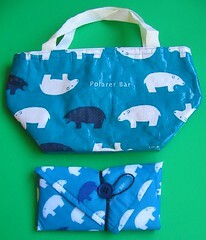 I threw both lunches into the blue "Polarer Bear" insulated lunch bag above (gotta love the Engrish -- my bear is polarer than your bear!). 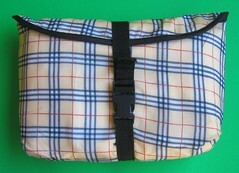 Both zippered bag and lunch wrapping cloth (furoshiki) are lined with insulated material to keep food cool or warm. 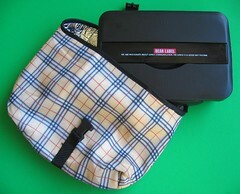 The 41 x 41 cm lunch cloth holds up to a 600ml two-tier box, with an easy elastic & button closure. I quite like the insulated lunch cloth -- it's compact and keeps multiple boxes tightly wrapped, so I can toss the whole secure bundle into my diaper bag. Bought for US$1.50 each at a Japanese dollar store in San Francisco. I also picked up a larger bag made of insulated material with an adjustable buckle. Holds larger boxes up to 1000ml: either a one-tier (max. size 21 x 16 x 5 cm) or a two-tier (max. size 20 x 9 x 8 cm). These kinds of products are indicative of the trend in Japan toward insulated lunch bags and better packed lunch food safety. If you like what we girls do here and would like to vote for us in the Blogger's Choice Awards here. Thanks for your support! This Post was written by Biggie, originally for Lunch in a Box. Sorry but I just have to - OMG!!! I have to admit - although I am experimental and my family are pretty painless when it comes to food - I do not think I have ever made pasta frittata (see me slapping my forehead with my hand) DUUH! Bigge, you are a genius. And I just need to get my hands on one of those bags! Do you know if they ship to Germany? Meeta: Unfortunately, the store doesn't do mail order. 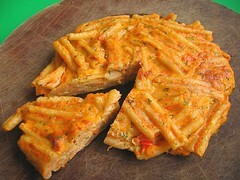 :-( I just love making breakfast frittatas out of leftover pasta, though. Spee: I put together a local SF Bay Area bento shopping guide here: http://ss-biggie.livejournal.com/36307.html I got the fish griller at Daiso (don't put it in the dishwasher! 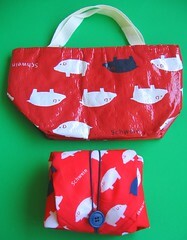 hand wash only), and the insulated wraps and lunch bags at Ichiban Kan in SF Japantown. Take a look at the shopping guide -- lots of good feedback from other SF locals. how do u grill vegies?..do u add any marinade? 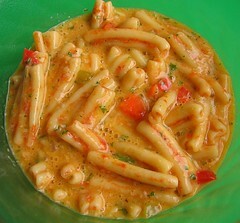 biggie, I love making this but never thot of it as lunch material. nice idea. Do Additives Make Children Hyper? Mother's Day - A special day for mommies!